Feels like a million years ago when Steven Soderbergh gave us Traffic, a gritty, dramatic thriller set in the world of drug trafficking. One thing that stood out from that awesome film was the performance of Benicio del Toro, who would go on to win Best Supporting Actor at the Oscars for the role. Fast forward 15 years, and I’m pretty sure Del Toro has at least another Oscar nomination coming his way. Once again, he plays a pivotal role in a drug trafficking film, this time, Sicario, directed by Denis Villeneuve (Prisoners, Enemy, and the upcoming untitled Blade Runner sequel!). I remember loving Traffic at the time, and I love Sicario. 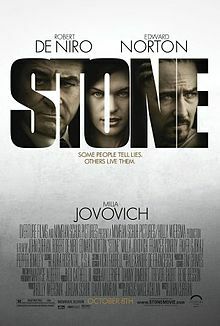 It’s one of the tensest, most heart-pounding thrillers I’ve seen in years. Fueled by three magnificent performances, a compelling plot and a dash of political intrigue, it’s the type of film that makes you forget how to breathe — in a good way. Sicario, a term used to represent a Latin American cartel hitman, focuses on the brutal border war by US agents against drugs coming in from Mexico. The narrative is driven by FBI special agent Kate Macer (Emily Blunt), who gets in way over her head when she is recruited to join a mysterious unit headed by Matt Graver (Josh Brolin), a Department of Defense consultant. Along for the ride is another consultant played by Del Toro, whose purpose and motives appear to be quite murky. From the very first sequence in the film you can tell it’s going to be one of those dark, morbid, gripping crime thrillers where lines are often blurred and crossed. The world depicted is brutal and unforgiving, and viewers need to be prepared for some very uncomfortable, chilling and terrifying moments. Villeneuve adopts tactics that are often seen in horror movies, with no shortage of grotesque images, great use of atmospheric silence, and loud artillery noises that can make you jump out of your seat at any second. The tension is executed so well that even during the slower moments you’re still on edge because you remain fearful that something terrible might happen. All of this ugliness is contrasted by some magnificent cinematography (Academy Awards, take note) by Roger Deakins, who already has 12 Oscar nominations to his name including Shawshank, Fargo, No Country for Old Men, Skyfall, Prisoner and Unbroken. The sprawling aerial shots of Mexico, the desert landscapes, the desolate night views — it brings a quiet beauty that accentuates all the relentless violence and death. Some of the images in this film have been etched deep into my memory. Another thing worth noting is the film’s use of sound and music. Sicario has a haunting soundtrack by Jóhann Jóhannsson (The Theory of Everything) that’s extremely effective because of how minimalist it is. Each beat adds to the adrenaline without being overwhelming or taking the attention away from the story at hand. What really makes Sicario stand out, however, is Villeneuve’s ability to humanise each character, no matter which side they are on. Everyone has a weakness, a vulnerability that others exploit. Good and bad is not clear cut — it’s more a matter of your individual point of view, and doing what you think is right and what it takes to survive. Full credit to Blunt, Brolin and Del Toro for their riveting performances and the casting department in getting it right. After Edge of Tomorrow, it’s easy to see Blunt as a badass, and I love her complex mix of courage and fear as a woman in the man’s world of drug cartels. It really brings a different perspective and tone to the story. Brolin’s of course solid as always, and he gets to be a little more laid back than we’re accustomed to seeing him as of late. But it is of course Del Toro who steals the show — as much as the show can be stolen from the other two — with his typical “what the hell is he thinking” facial expressions and brooding, physical presence. The dude is just an absolute legend and I can’t wait to see what he brings to the table in Star Wars Episode VIII! I’ve been racking my brain to try and think of things I didn’t like about this movie. I can’t. It’s not the easiest movie to watch or the most entertaining movie out there, but just everything about Sicario is borderline masterful; I loved the performances, the stylish direction, the cinematography, the sounds, and above all the numbing tension. It is without a doubt one of the year’s best films. I love time travel films, and one of my favourites of all-time also had Bruce Willis in it (Twelve Monkeys, of course). Given that I have also recently developed a man-crush on Joseph Gordon-Levitt, Looper appeared to be a tailor-made film for me. The movie is set in the year 2044 and the future of that future is 2074, a time when time travel has finally been invented (I still have a chance to live to that day, so fingers crossed that this is based on a true story). Unfortunately, time travel is outlawed then but is still being used by criminal organizations, which need a “looper” to help them in the past when they transport things back over from the future. Gordon-Levitt is a young looper. Bruce Willis is him in 30 years. I can’t say why, but they don’t like each other. It may sound complicated but I actually found Looper to be a really straightforward time-travel movie. The mechanics and laws of time travel in the film’s universe are sufficiently described in the beginning and there’s not much to be confused about, which is why I was really confused by all these reviewers saying that the film was confusing. Some even compared it to Christopher Nolan’s Inception, which I found strange because they are nothing alike apart from the fact that both star Gordon-Levitt. Looper is an unusual and unusually clever time-travel film in the sense that it’s more of a character movie about how people deal with the effects of time travel rather than the time travel itself. From that perspective it means less trying to figure out what’s going on/pointing out gaps in logic and more just enjoying the movie for its action and freaky futuristic stuff. It’s always hard to review a movie like this without slipping in unnecessary spoilers, so all I will say is that it also stars Emily Blunt and is in part related to genetic mutations which occur naturally in the human body at some point in the future (I am begging for this to be based on a true story). Some people have criticized the decision to use prosthetics and make-up on Gordon-Levitt to make him look like a young Bruce Willis. I thought it was awesome. I have to admit, the thin-framed Gordon Levitt is one of the last actors I would have pictured playing John “Yippee-ki-yay” McClane, but the prosthetics made me believe he could have eventually grown to look like him. He still looks like Gordon-Levitt but it also reminds you a little of Bruce Willis – I don’t get what the big deal is. Despite my praises, I think there is something missing from Looper that prevents it from being a time-travel classic like Twelve Monkeys, Back to the Future, Terminator 2, and so forth. The film has a great premise, interesting characters, solid action and enough twists and turns to make it a highly enjoyable experience, but perhaps it lacked the grand vision and scale that would have pushed it to that next level. William Shakespeare’s Romeo and Juliet is an all-time classic. Animated garden gnomes are deliciously cute. Elton John’s music is sensational. James McAvoy and Emily Blunt are both likable Brits. 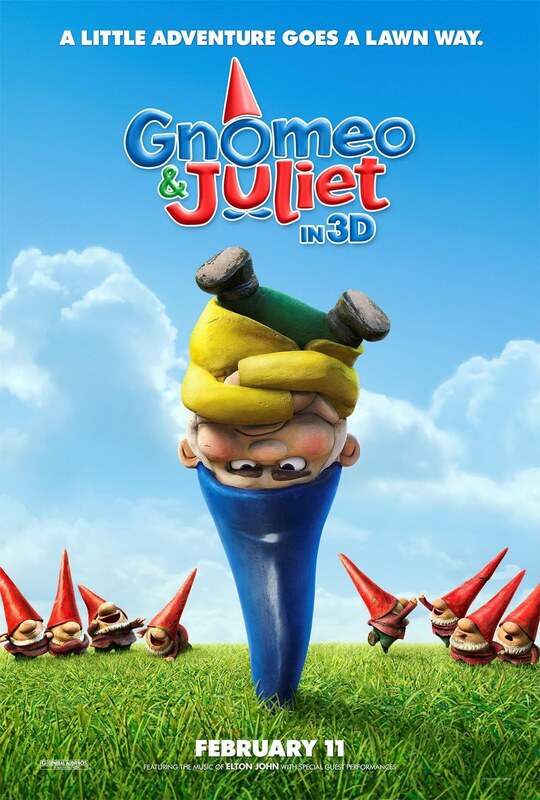 But the culmination of all of these things, Gnomeo & Juliet, is one of the worst animated films I’ve ever seen. And it’s in pointless 3D. I had reasonable expectations for this one for the above reasons, and the fact that the promotional campaign made it look like a fun, funny, musical spectacular with an all-star voice cast (including, apart from McAvoy and Blunt, Jason Statham, Stephen Merchant, Michael Caine, Maggie Smith, Ozzy Osbourne, Patrick Stewart and Hulk Hogan!). But somehow, Gnomeo & Juliet turned out to be painfully unfunny and entirely uninspiring. How could this be possible? The garden gnome jokes were essentially exhausted in the first few minutes, and the rest of it was repetitive and unclever. Yes, the garden gnomes were cute, but that alone wasn’t enough to carry the film. 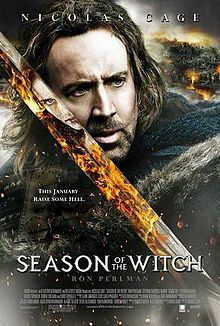 I actually had a couple of micro naps during the film, which has not happened since Van Helsing. Worse still, Elton John’s music was criminally underused. How they managed to screw up something with so much potential is beyond me. The worse part is probably the lack of heart. I wasn’t moved at all by the story or the characters. Disney/Pixar/Dreamworks are light years ahead when it comes to creating a cartoon that connects with audiences. And yes, once again the 3D served no purpose other than to rip people off.